Tell Your Senator: Keep Betsy DeVos Away from our Public Schools! Just look at DeVos’ home state of Michigan, where she and her husband have poured millions into privatization. Charter schools are showing subpar outcomes, are rife with abuses, and lack public accountability. She even spent more than a million dollars to stop the Michigan legislature from cleaning up the state’s for-profit charter schools. DeVos is a strong advocate for voucher programs to send public dollars to private religious schools. DeVos has never taught children or served as administrator of any educational institution, and she has no credentials in teaching or education whatsoever. DeVos has never even attended a public school, nor did she send her own children to one. That’s privatization in a nutshell: low-income families must suffer the effects of these dangerous policies while the wealthy opt out. Her only qualification seems to be how she has spent her money: both as an opponent of public education and a major donor to the Trump campaign. Tell your Senators to oppose Betsy DeVos: keep her away from our public schools! I am writing to urge you to vote against confirmation of billionaire Betsy DeVos for Education Secretary. 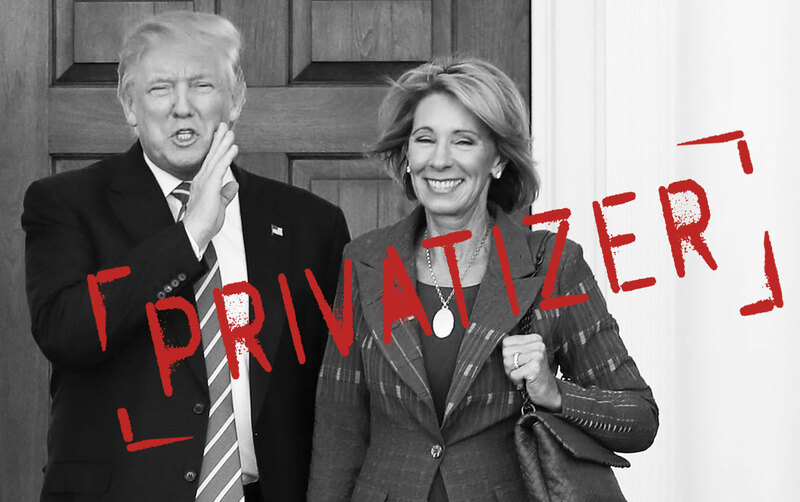 DeVos' agenda of privatization through charters and vouchers will hurt low-income families and benefit the wealthy. Public education is great when all children have an opportunity to learn: DeVos will work against that vision. Please oppose and vote against Detsy DeVos for Education Secretary, and tell Mr. Trump to nominate someone who truly cares about public education for all.